One of my favorite jokes goes like this: “I got really drunk last night, so I decided to take the bus home. Now that may not sound impressive to you, but I’ve never driven a bus before.” Stop the Presses! Drunk drivers may soon not need to drive the bus – or their car – anymore. Welcome to the world of self-driving cars. They’re just around the corner. Several tech companies like Tesla, Google and Apple are driving ahead with plans to mass-produce “autonomous” cars. These boring box vehicles are designed to ruin your happiness. If successful, they will all take away your freedom to cruise the open road at 90 mph, steering only with your knees, while singing Tom Petty’s Free Fallin’ off-key at the top of your lungs with the top rolled down. We need to slam the brakes on this effort. Our forefathers, who guaranteed the right to drive in the Bill of Rights, would be mortified at this attack on our this fundamental constitutional liberty. If these tech companies succeed, it’s only a matter of time before other companies will start manufacturing self-cleaning ovens, self-navigating vacuum cleaners or even self-playing pianos. Today they’re coming for your car. Tomorrow they’ll be coming for your kids. 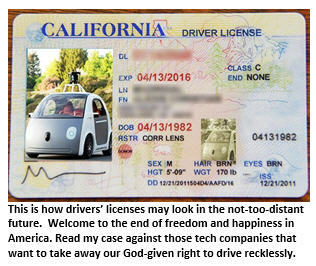 Read my argument in fierce opposition to the freedom-crushing future of autonomous cars. 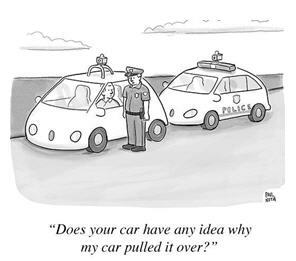 Argument for autonomous cars: Autonomous cars are far superior drivers. They will never get distracted by what’s going on around them. They won’t feel a need to check out who just texted them or try to balance their McDonald’s drive-through meal on their lap, swerving as they reach for their French fries that just fell to the floor. My rebuttal: Are you trying to impugn the greatness of our nation’s finest fast food chain? You really hate America, don’t you? And I would never get distracted checking text messages while driving. I’m usually far too busy staring at my rearview mirror and shouting at my daughters, who are arguing with each other in the back seat about what video to watch on the minivan monitor. Argument: Autonomous cars will dramatically lower automobile injuries and fatalities. If only 10% of U.S. vehicles on the road were self-driving, it would reduce car accidents by over 200,000 and save over 1,000 lives per year. If 90% of vehicles were self-driving, it would save 22,000 lives annually. My rebuttal: Oh, I see where this is going. You think that by throwing out all sorts of fancy research statistics, you’ll sound all intellectual and superior. Well, did you know that if you lined up every car manufactured in the year 2015, it would circle the earth 1.5 times? And I’ll bet you didn’t know that there are 380,000 different known species of beetles – 380,001 if you count the VW Beetle! Two can play this game, Mr. Know-It-All. Argument: Autonomous cars will result in greatly reduced auto insurance premiums, saving the average American over $400 a year. And because they are much safer to drive, the annual cost of car repairs and medical bills nationwide will drop by several million dollars due to the dramatic reduction in accidents. My rebuttal: So, all you have to make your case is more irrefutable facts and documented field studies, I see. Well, here’s an irrefutable fact I’ll bet you didn’t know: MLB pitcher Jim Abbott was born without a right hand and in 1993 threw a no-hitter for the New York Yankees against the Cleveland Indians. Argument: I knew that. Did you know that the notorious bank robber John Dillinger was once a minor league professional second baseman? My rebuttal: Um, nope. Damn, you’re good at this game. Argument: Self-driving cars will reduce traffic congestion and time spent commuting. Computer systems on cars will be able to talk with those on the other vehicles nearby, thus allowing for doubling or even tripling of the traffic density on the roads, and optimizing vehicular driving speed and traffic flow. My rebuttal: So what you’re saying is it means I will end up getting to work faster? Why on earth would I want that? I love listening to ESPN radio in my morning commute as they describe the latest off-season NFL trades ad nauseam. And that would also mean getting home from work sooner. In that case my wife would just expect me to help out making dinner on a regular basis. I’ll take my traffic jams, thank you very much. Argument: Such vehicles will result in far greater fuel economy, lowering gasoline expenditures for the average American driver by over $375 per year because the vehicle’s on-board computers will be far more efficient at maintaining a safe, high-mileage rate of speed. My rebuttal: Not so fast, buster. With all these gasoline savings, that means American oil companies will lose billions of dollars in profits, which means they will be forced to lay off thousands of workers, forcing our economy into a tailspin. So what you’re proposing is we should KILL OUR ECONOMY. What kind of capitalism-hating subversive are you? Argument: Driving in crowded cities in search of a parking spot will become a thing of the past. Your car will drop you off at your location and then search for a parking space by assessing the inventory of available spaces within a pre-determined radius. Then on your command, it will come back to pick you up. This alone will save the average American over 75 hours a year driving to locate a parking space. My rebuttal: Um, er…. Well, if we let this happen, the terrorists will win. My rebuttal: Okay, I admit it. I didn’t really have a good rebuttal for that last one. Sue me. Argument: Even if you are stuck in traffic, you’ll now be able to turn your front seat backwards and talk to the backseat passengers like on a train. You can even go to sleep, knowing that your car will wake you upon arrival at your destination. My rebuttal: Yeah? Well, I hate you. And I think you’re fat, too! Argument: That’s your best rebuttal? 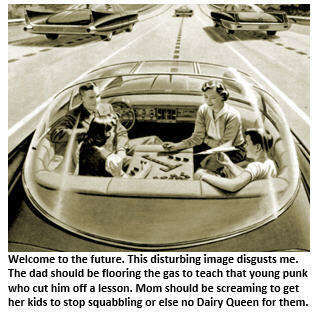 By the way, driverless cars will mean you’ll never have to worry about your daughters driving while impaired. They’ll be almost 100% assured of arriving home safely every night. Okay, I see their point.